Hello. Welcome to NxtNutrio, Ltd. ("we" "us" "our" or "NxtNutrio")! The NxtNutrio website (the "Site"), its applications (the "Apps"), and content available on the Site and Apps (the "Content") are copyrighted work belonging to NxtNutrio. 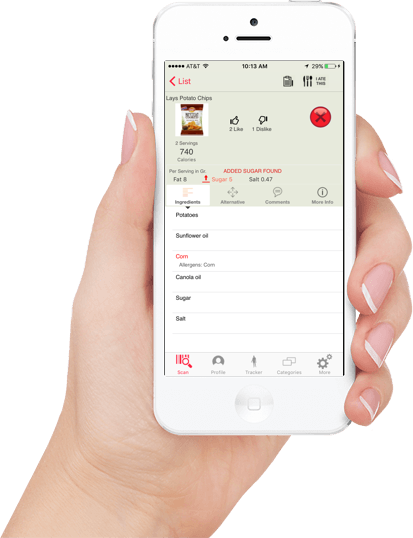 NxtNutrio services help consumers make food choices through food, nutrition, and ingredient information and content. Such services may be accessed through the Site, Apps, Content, APIs, and data feeds (collectively the "Services"). ALL INFORMATION CONTAINED ON THE SERVICES (INCLUDING THE SITE, APPS, AND CONTENT), INCLUDING NUTRIENT INFORMATION, INGREDIENTS, FOOD ALLERGENS, AND INFORMATION RELATING TO MEDICAL AND HEALTH CONDITIONS IS FOR INFORMATIONAL PURPOSES ONLY AND NOT PROVIDED AS MEDICAL ADVICE. NxtNutrio DOES NOT ASSUME ANY LIABILITY FOR INACCURACIES OR MISSTATEMENTS ABOUT PRODUCTS, WHETHER BASED ON MANUFACTUER INFORMATION, THIRD PARTY INFORMATION, NxtNutrio USERS INFORMATION OR ON RATINGS AND ASSESMENTS GENERATED BY NxtNutrio. YOU SHOULD CAREFULLY READ ALL INFORMATION PROVIDED BY THE MANUFACTURERS OF THE PRODUCTS, WHETHER ONLINE OR ON THE ACTUAL PRODUCT PACKAGING AND LABELS, INCLUDING NUTRIENT CONTENT, INGREDIENTS, FOOD ALLERGEN AND CONTACT INFORMATION, AND HEALTH CLAIMS, BEFORE USING OR CONSUMING A PRODUCT. FOR ADDITIONAL INFORMATION ABOUT A PRODUCT, PLEASE CONTACT THE MANUFACTURER DIRECTLY. INFORMATION ON THE SERVICES IS NOT INTENDED AS A SUBSTITUTE FOR THE ADVICE PROVIDED BY A QUALIFIED AND LICENSED HEALTHCARE PROFESSIONAL. YOU SHOULD NOT USE INFORMATION ON THE SERVICES FOR THE DIAGNOSIS OR TREATMENT OF A HEALTH PROBLEM OR DISEASES. YOU SHOULD ALWAYS CONSULT YOUR HEALTHCARE PROVIDER BEFORE MAKING ANY DIETARY OR NUTRITIONAL CHANGES. IN ADDITION TO ALL OTHER LIMITATIONS AND DISCLAIMERS IN THIS AGREEMENT, NxtNutrio DISCLAIMS ANY LIABILITY OR LOSS IN CONNECTION WITH THE CONTENT PROVIDED ON THE SERVICES. Account Creation. In order to use certain features of the Services, you must register for an account with NxtNutrio ("NxtNutrio Account") and provide certain information about yourself as prompted by the registration form. You represent and warrant that: (a) all required registration information you submit is truthful and accurate; (b) you will maintain the accuracy of such information; and (c) your use of the Services does not violate any applicable law or regulation or the terms of this Agreement. Communication from NxtNutrio and other Users. By using the Service, you agree to receive certain communications, for example, you may receive an update on products you scanned, or you may receive a periodic e-mail newsletter from NxtNutrio. You can opt-out of non-essential communications by mailing privacy@NxtNutrio.com or unsubscribing from the email notification. You acknowledge that all the intellectual property rights, including copyrights, patents, trademarks, and trade secrets, in the Services (including the Site, Apps, and Content, but excluding any User Content as defined herein) are owned by NxtNutrio or NxtNutrio's suppliers. The provision of the Services does not transfer to you or any third party any rights, title or interest in or to such intellectual property rights. NxtNutrio and its suppliers reserve all rights not granted in this Agreement. Subject to the terms of this Agreement, NxtNutrio grants you a non-transferable, non-exclusive, license (without the right to sublicense) to (a) use the Services solely for your personal, non-commercial purposes, and (b) install and use the Apps, solely on your own handheld mobile device (e.g., iPhone, Android, etc. as applicable) and solely for your personal, non-commercial purposes. The rights granted to you in this Agreement are subject to the following restrictions: (a) you shall not license, sell, rent, lease, transfer, assign, distribute, host, or otherwise commercially exploit the Services; (b) you shall not modify, make derivative works of, disassemble, reverse compile or reverse engineer any part of the Services; (c) you shall not access the Services in order to build a similar or competitive service; (d) except as expressly stated herein, no part of the Services may be copied, reproduced, distributed, republished, downloaded, displayed, posted or transmitted in any form or by any means; (e) You may not copy or modify the code used to provide the Services; and (f) You may not use the Site, Apps, Content, or Services on or in connection with any other website, for any purpose. Any future release, update, or other addition to functionality of the Services shall be subject to the terms of this Agreement. All copyright and other proprietary notices on the Site must be retained on any copies. Use of Services at Your Own Risk. Your access to and use of the Site, Content, Apps, and Services is at your own risk. NxtNutrio will have no responsibility for any harm to your computing system, loss of data, or other harm to you or any third party, including, without limitation, any bodily harm, that results from your access to or use of the Site, Apps, Content, or Services, or reliance on any information or advice with respect to any food products. NxtNutrio has no obligation to provide you with customer support of any kind. However, NxtNutrio may provide you with customer support from time to time, at NxtNutrio's sole discretion. NxtNutrio reserves the right, at any time, to modify, suspend, or discontinue the Services (including the Site, Apps, and APIs) or any part thereof with or without notice. NxtNutrio reserves the right to integrate into a different web service, migrate to a different URL, modify or discontinue, restrict or block access to, the Services without notice to you. NxtNutrio may modify or remove any Content from the Services at any time without notice to you. NxtNutrio is not liable for any such modification, suspension, discontinuance or removal. You agree that NxtNutrio will not be liable to you or to any third party for any modification, suspension, or discontinuance of the Services or any part thereof. "User Content" of a user means any photographs, pictures, content, text, artwork, files, programs, sound, graphics, video, data, product ratings, product comments, or forum post and other similar materials that a user submits, emails or otherwise uses with the Services. "Your User Content" means User Content that you provide to NxtNutrio. "Media" means any means of conveying information, whether now known or hereafter devised. You are solely responsible for your User Content. You assume all risks associated with use of User Content, including any reliance on its accuracy, completeness or usefulness by others, or any disclosure of Your User Content that makes you or any third party personally identifiable. By using Your User Content with the Services, you automatically grant, and you represent and warrant that you have the right to grant, to NxtNutrio an irrevocable, nonexclusive, royalty-free and fully paid, worldwide license to reproduce, distribute, publicly display and perform, prepare derivative works of, incorporate into other works, and otherwise use Your User Content, and to grant sublicenses of the foregoing, solely for the purposes of including Your User Content in the Services. You agree to irrevocably waive (and cause to be waived) any claims and assertions of moral rights or attribution with respect to Your User Content. NxtNutrio will treat any feedback or suggestions you provide to NxtNutrio as non-confidential and non-proprietary. Thus, in the absence of a written agreement with NxtNutrio to the contrary, you agree that you will not submit to NxtNutrio any information or ideas that you consider to be confidential or proprietary. You hereby grant to NxtNutrio a worldwide, perpetual, irrevocable, nonexclusive, royalty-free, fully-paid up, transferable right and license, with the right to sublicense through multiple levels of sublicensees, under all of your intellectual property and other rights in Your User Content, to (a) reproduce, distribute, transmit, publicly perform and publicly display Your User Content, in whole or in part, in any manner and Media, (b) modify, adapt, translate and create derivative works from Your User Content, in whole or in part, in any manner and Media, (c) sublicense the foregoing rights, in whole or in part, to any third party, with or without a fee and (d) exercise any and all other present or future rights in Your User Content. Trademarks and Likenesses License Grants. You hereby grant to NxtNutrio a worldwide, perpetual, irrevocable, nonexclusive, royalty-free, fully-paid up, transferable right and license, with the right to sublicense through multiple levels of sublicensees, under all of your intellectual property and other rights in Your User Content, to use all trademarks, trade names and the names and likenesses of any individuals that appear in Your User Content. You grant NxtNutrio the right to use the name that you submit in connection with Your User Content. You hereby waive and agree never to assert any claim of Moral Rights in Your User Content against NxtNutrio or any of NxtNutrio's licensees. "Moral Rights" means any right to (a) divulge Your User Content to the public; (b) retract Your User Content from the public; (c) claim authorship of Your User Content; (d) object to any distortion, mutilation or other modification of Your User Content; or (e) any and all similar rights, existing under judicial or statutory law of any country or jurisdiction in the world, or under any treaty regardless of whether or not such right is called or generally referred to as a moral right. You agree that you will not submit User Content that is unlawful, pornographic, libelous, defamatory, tortious, obscene, or racially, ethnically or otherwise objectionable or that otherwise violates general NxtNutrio community standards. We expressly reserve the right to remove or not make available any User Content that we deem to be in violation of this Agreement, applicable laws or our community standards in our sole discretion. You agree that you will not upload, post, e-mail or otherwise transmit User Content to us that contain software viruses or any other computer code, files, or programs designed to interrupt, destroy or limit the functionality of any computer software or hardware or telecommunications equipment. NxtNutrio and its licensees may publicly display advertisements and other information adjacent to or included with Your User Content. You are not entitled to any compensation for such advertisements. The manner, mode and extent of such advertising are subject to change without specific notice to you. You hereby affirm, represent, and warrant that (a) you own, or have the necessary licenses, rights, and/or consents to use Your User Content with the Services as described herein; (b) Your User Content does not infringe any copyright or any other intellectual property right of any third party; (c) Your User Content, and NxtNutrio's exercise of its rights hereunder, do not and will not violate, misappropriate or infringe any intellectual property right, including but not limited to trademark rights, copyrights, moral rights and publicity rights of any third party; (d) you possess all rights necessary for the reproduction, distribution, transmission, public performance, public display, and other exploitation of Your User Content by NxtNutrio as permitted hereunder; (e) Your User Content is not pornographic, obscene, libelous, defamatory, tortious, or otherwise unlawful; (f) all factual statements submitted by you are accurate and not misleading; and (g) Your User Content does not in any other way violate the Acceptable Use Policy (defined below). We reserve the right (but have no obligation under this Agreement) to review any User Content, investigate, and/or take appropriate action against you, in our sole discretion, if you violate the Acceptable Use Policy or any other provision of this Agreement, including removing or modifying your User Content, terminating your NxtNutrio Account, and/or reporting you to law enforcement authorities. We may also remove or modify your User Content if it, in our sole judgment, violates the rights of, harms, or threatens the safety of any other person, or creates liability for us or any other person. In order to cooperate with legitimate governmental requests, subpoenas or court orders, or to protect our business and customers, we may access and disclose any information considered necessary or appropriate, including your NxtNutrio Account username and password, IP address and traffic information, usage history, and your User Content. The Services may contain links to third party sites and advertisements for third parties (collectively, "Third Party Sites & Ads"). Such Third Party Sites & Ads are not under the control of NxtNutrio and NxtNutrio is not responsible for any Third Party Sites & Ads. NxtNutrio provides these Third Party Sites & Ads only as a convenience and does not review, approve, monitor, endorse, warrant, or make any representations with respect to Third Party Sites & Ads. Advertisements and other information provided by Third Party Sites & Ads may not be wholly accurate. You acknowledge sole responsibility for and assume all risk arising from your use of any such websites or resources. When you link to a Third Party Site, the applicable service provider's terms and policies, including privacy and data gathering practices govern. You should make whatever investigation you feel necessary or appropriate before proceeding with any transaction with any third party. Your transactions and other dealings with Third Party Sites & Ads that are found on or through the Site, Apps or Services, including payment and delivery of related goods or services, are solely between you and such merchant or advertiser. Each user of the Service is solely responsible for any and all their User Content. Because we do not control User Content, you acknowledge and agree that we are not responsible for any User Content and we make no guarantees regarding the accuracy, currency, suitability, or quality of any User Content, and we assume no responsibility for any User Content. Your interactions with other Service users are solely between you and such user. You agree that NxtNutrio will not be responsible for any loss or damage incurred as the result of any such interactions. If there is a dispute between you and any Service user, we are under no obligation to become involved. THE SERVICES (INCLUDING SITE, APPS, AND CONTENT) AND USER CONTENT ARE PROVIDED "AS IS", WITHOUT WARRANTY OR CONDITION OF ANY KIND, EITHER EXPRESS OR IMPLIED. WITHOUT LIMITING THE FOREGOING, NXTNUTRIO EXPLICITLY DISCLAIMS ANY WARRANTIES OF MERCHANTABILITY, FITNESS FOR A PARTICULAR PURPOSE, TITLE, QUIET ENJOYMENT OR NON-INFRINGEMENT. NXTNUTRIO MAKES NO WARRANTY THAT THE SITE, APPS, CONTENT, USER CONTENT OR SERVICES WILL MEET YOUR REQUIREMENTS OR BE AVAILABLE ON AN UNINTERRUPTED, SECURE, OR ERROR-FREE BASIS. NXTNUTRIO MAKES NO WARRANTY REGARDING THE QUALITY OF ANY PRODUCTS, SERVICES, OR INFORMATION OBTAINED THROUGH THE SITE, APPS, CONTENT, USER CONTENT OR SERVICES, OR THE ACCURACY, TIMELINESS, TRUTHFULNESS, COMPLETENESS OR RELIABILITY OF ANY INFORMATION OBTAINED THROUGH THE SITE, APPS, CONTENT, USER CONTENT OR SERVICES, INCLUDING, WITHOUT LIMITATION, ANY INFORMATION OR ADVICE WITH RESPECT TO ANY FOOD PRODUCT. NXTNUTRIO DOES NOT REGULARLY MONITOR OR UPDATE THE ACCURACY OR RELIABILITY OF THE CONTENT OR USER CONTENT. NO ADVICE OR INFORMATION, WHETHER ORAL OR WRITTEN, OBTAINED FROM NXTNUTRIO OR THROUGH THE SITE, APPS, CONTENT, USER CONTENT OR SERVICES, WILL CREATE ANY WARRANTY NOT EXPRESSLY MADE HEREIN OR CREATE ANY LIABILITY ON THE PART OF NXTNUTRIO. THE SITE, APPS, CONTENT, USER CONTENT AND SERVICES ARE FOR CONSUMER EDUCATIONAL USE ONLY. NOTHING CONTAINED IN THE SERVICES IS OR SHOULD BE CONSIDERED, OR USED AS A SUBSTITUTE FOR, MEDICAL, NUTRITIONAL OR ANY OTHER PROFESSIONAL ADVICE, DIAGNOSIS OR TREATMENT. THIS SITE, APPS, CONTENT AND THE SERVICES DO NOT CONSTITUTE THE PRACTICE OF ANY MEDICAL, NUTRITIONAL, DIETETIC, NURSING OR OTHER PROFESSIONAL HEALTH CARE ADVICE, DIAGNOSIS OR TREATMENT. NXTNUTRIO ADVISES USERS TO ALWAYS SEEK THE ADVICE OF A PHYSICIAN OR OTHER QUALIFIED, LICENSED HEALTH CARE PROVIDER WITH ANY QUESTIONS REGARDING PERSONAL HEALTH, NUTRITION OR MEDICAL CONDITIONS. NEVER DISREGARD, AVOID OR DELAY IN OBTAINING MEDICAL ADVICE FROM YOUR DOCTOR OR OTHER QUALIFIED, LICENSED HEALTH CARE PROVIDER BECAUSE OF SOMETHING YOU HAVE READ ON THE SITE OR APPS. NXTNUTRIO MAKES NO REPRESENTATIONS OR WARRANTIES ABOUT THE INFORMATION, TOOLS, OR CONTENT INCLUDED IN THE SITE, APPS, CONTENT, USER CONTENT OR SERVICES. PLEASE ALSO REVIEW THE SPECIFIC DISCLAIMERS IN SECTION "CERTAIN DISCLAIMERS". You agree to indemnify and hold NxtNutrio, its successors, subsidiaries, affiliates, any related companies, its suppliers, licensors and partners, and the officers, directors, employees, agents and representatives of each of them harmless, including costs and attorneys' fees, from any claim or demand made by any third party due to or arising out of (a) your use of the Services, (b) your User Content, or (c) your violation of this Agreement. NxtNutrio reserves the right, at your expense, to assume the exclusive defense and control of any matter for which you are required to indemnify us and you agree to cooperate with our defense of these claims. You agree not to settle any matter without the prior written consent of NxtNutrio. NxtNutrio will use reasonable efforts to notify you of any such claim, action or proceeding upon becoming aware of it. If you violate any of these Terms of Service, your permission to use the Site, Apps, Content, and Services will automatically terminate. NxtNutrio reserves the right to revoke your access to and use of the Site, Apps, Content, and Services at any time, with or without cause. Filing a notice of infringement with NxtNutrio requires compliance with the requirements specified in Title II of the Digital Millennium Copyright Act of 1998. The text of this statute can be found at the U.S. Copyright Office web site, http://lcweb.loc.gov/copyright . You acknowledge and agree that NxtNutrio may revise these Terms of Service from time to time. By continuing to access or use the Site, Content, or Services after NxtNutrio makes any such revision, you agree to be bound by the revised Terms of Service. The failure of NxtNutrio to enforce any right or provision of these Terms of Service will not be deemed a waiver of such right or provision. This Agreement shall be governed by the laws of the State of Israel without giving effect to any conflict of laws principles that may provide the application of the law of another jurisdiction. Notwithstanding the foregoing, we may seek injunctive or other equitable relief to protect our intellectual property rights in any court of competent jurisdiction. Copyright 2009-2017, NxtNutrio. All rights reserved. All trademarks, logos and service marks ("Marks") displayed on the Services are our property or the property of other third parties. You are not permitted to use these Marks without our prior written consent or the consent of such third party which may own the Marks. If you have any questions about these Terms of Service, please contact NxtNutrio at support@NxtNutrio.com.